In this work, we show how to use the positive results on succinct argument systems to prove impossibility results on leakage-resilient black-box zero knowledge. This recently proposed notion of zero knowledge deals with an adversary that can make leakage queries on the state of the prover. Our result holds for black-box simulation only and we also give some insights on the non-black-box case. Additionally, we show that, for several functionalities, leakage-resilient multi-party computation is impossible (regardless of the number of players and even if just one player is corrupted). More in details, we achieve the above results by extending a technique of [Nielsen, Venturi, Zottarel – PKC13] to prove lower bounds for leakage-resilient security. Indeed, we use leakage queries to run an execution of a communication-efficient protocol in the head of the adversary. Moreover, to defeat the black-box simulator we connect the above technique for leakage resilience to security against reset attacks. 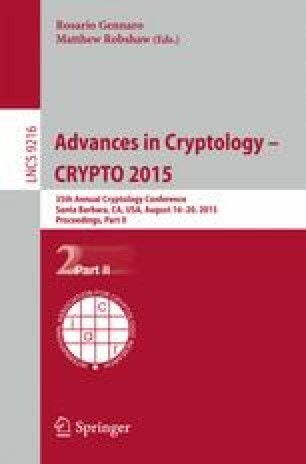 Our results show that the open problem of [Ananth, Goyal, Pandey – Crypto 14] (i.e., continual leakage-resilient proofs without a common reference string) has a negative answer when security through black-box simulation is desired. Moreover our results close the open problem of [Boyle et al. – STOC 12] for the case of black-box simulation (i.e., the possibility of continual leakage-resilient secure computation without a leak-free interactive preprocessing). We thank the anonymous reviewers for their useful comments. The full version of this work appears in . Part of this work was done while the second and third authors were visiting the Computer Science Department of UCLA. This work has been supported by NSF grants 09165174, 1065276, 1118126 and 1136174, US-Israel BSF grant 2008411, OKAWA Foundation Research Award, IBM Faculty Research Award, Xerox Faculty Research Award, B. John Garrick Foundation Award, Teradata Research Award, and Lockheed-Martin Corporation Research Award. This material is based upon work supported by the Defense Advanced Research Projects Agency through the U.S. Office of Naval Research under Contract N00014 -11 -1-0392. The views expressed are those of the author and do not reflect the official policy or position of the Department of Defense or the U.S. Government.